IMG_0982, originally uploaded by tantek. 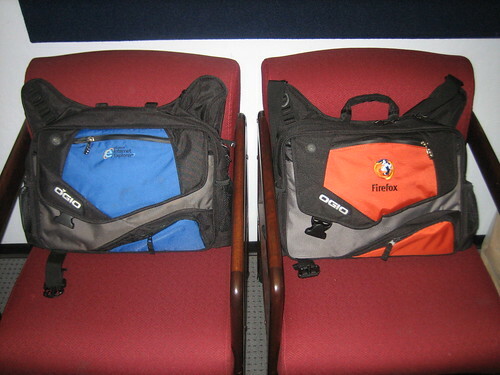 Micorosoft and Mozilla use the same brand and model for their bags. Who’s copying whom? I’ve gotten to be a part of some awesome things this year, here’s a recap. Last year I started recapping my year, but only made it through the first month. I’ll try and make it farther this time. Back in ‘05, BarCamp was started by a bunch of techno-hippies (including myself) in SF. In 2006, BarCamp took off. I can’t even tell you all the countries that have had BarCamps– it’s become an international phenomenon. I got to go to SxSW for the first time this year. On the urging of Tantek I stayed for music. It was probably the best week of my year– the first half was all geekery and free beer. The second half was all music and more music. Getting to hang out with some super music geeks made it even more rocktacular. I proposed and got accpeted presentations at XTech, in Amsterdam, and WWW2006 in Edinburgh. Since they were in back to back weeks, I made a long trip of it, stopping off in London on my way home. I got to meet a number of people who I’d only know there the Internets. The strangest moment was when I was giving a developer’s tutorial on microformats at WWW2006 (with Suda, filling in for Molly) and I was going through my typical intro material of “History of HTML”. Of course, as I was doing this, none other than Tim Berners Lee, the inventor of HTML, was sitting in the second row. I rode Critical Mass on Halloween. If you’re not familiar with Critical Mass, it’s a monthly bike ride takes place in many cities, where cyclists meet in large enough groups to take over the streets. The SF Halloween Critical Mass ride was literally thousands of riders, if not ten thousand. We disrupted the entire city’s traffic for an entire evening. Nearly two years ago, I moved to San Francisco to study at the University of San Francisco. This morning I took my last exam. I’ll soon be a Master of Science in Internet Engineering. It’s a very strange feeling. I’ve been in school for most of the last 19 years of my life, and I can’t say how relieved I feel to be done. It’s not that I didn’t think school has been worthwhile, it’s just a great feeling to suddenly have one fewer responsibility. I’m sure you’re now asking “what’s next?” (hi, mom). What’s next is taking some time off. Some friends and I have a ski house in South Lake Tahoe for the season and I plan on spending pretty much all of January there. I’ll be around SF, too, but I won’t be working much (if at all). We’re actually heading up to the house this weekend, too, and I’m skipping my own graduation to go skiing (please don’t say that I should sit through a boring 3 hour ceremony instead of skiing, seriously). I have a bunch of projects I want to work on. Many of them programming related, others more creative and corporeal. I look forward to just getting to work on whatever I feel like for awhile. Awhile back Technorati launched a feature that allows you to claim your blog using OpenID. That means that if your blog host can work as an identity provider (LiveJournal, TypePad and others already support this), that’s all we need to be sure that you own that blog. Starting today, Technorati can also be used as an identity provider. I hope you find this useful. On a related note, there’s been some discussion lately about how hCard, XFN and OpenID can work together. Expect to see more once I’m done with grad school (less than a week to go until my last exam). You are currently browsing the the ryan king weblog archives for December, 2006.